The Merci Train was a gift to the people of the US from the people of France, given in appreciation for the Friendship Food Train that Americans had sent to war-torn Europe in 1947. The train consisted of 49 WWI era boxcars. Each car was filled with hundreds of gifts. Each state (and the Territory of Hawaii) received a boxcar. Almost all can still be found today... if you know where to look. In 1947, a Friendship Train carried $40 million in relief supplies to France and Italy. The 700-car train was the brainchild of Drew Pearson, an American newspaper columnist. It was his concept that Americans were not getting the credit they deserved for helping war-torn Europe in the face of Russian disinformation -- and that we could make it clear where their food aid was coming from if only we'd take a more personal approach. And so a grass-rots effort was started that began in Hollywood with a handful of boxcars full of food donated by average Americans. As the little train moved across the country, its popularity and notoriety skyrocketed. By the time it reached New York, it was actually three trains coming in from all different directions. Once in New York, the food was unloaded and sent by ship -- with ample notice where it was coming from -- to France and Italy. It received a tremendous reception. The Italians sent a 'thank you' in the form of four statues that now grace the ends of the Theodore Roosevelt Memorial Bridge and the Arlington Memorial Bridge in Washington, DC. They also produced a short film expressing their gratitude called "Thanks, America!" -- to be played in US movie theaters ahead of any given feature. The French took things a big step further. A French veteran and railroad worker named Andre Picard stated a movement to send surplus WWI era boxcars to the US filled with tokens of appreciation from the people of France to the people of America. In all, 49 boxcars would be sent -- each packed with mementos from French citizens of every age and class. Each state would receive a boxcar. One would be split between Washington, DC and the territory of Hawaii. The boxcars were of an especially appropriate type -- known as the 40 et 8 -- 'suitable' for 40 men or 8 horses. These small boxcars had transported thousands of American GIs during the wars; each cramped, bumpy ride leaving a lasting impression on the passengers. 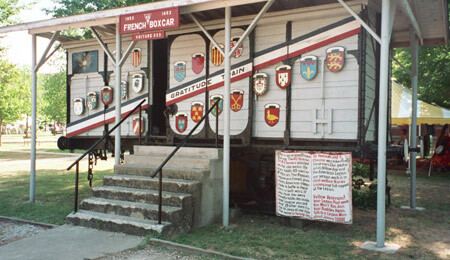 Each boxcars was decorated with a painted 'Gratitude Train' ribbon and with 40 coat-of-arms representing the provinces of France. The French boxcars arrived in New York Harbor aboard the ship Magellan in February 1949. The ship was met by waves of aircraft and a flotilla of boats. With 'Merci, America' painted across its hull, it was docked and unloaded. New York's boxcar was paraded though Manhattan. 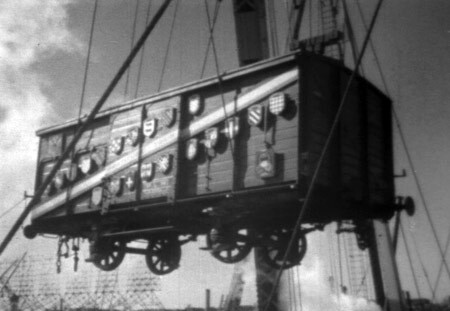 The other boxcars were loaded onto flatcars (their wide wheel axles not compatible with our track width) and sent off to the far reaches of the nation. Each state had a reception waiting for their boxcar. Several states sent their boxcars on tours of the state so everyone could see the car and its contents. They came to rest permanently in municipal parks, railroad museums, fairgrounds and Veterans Posts. Most survive to this day. Dozens of French 40 et 8 boxcars -- enduring symbols of friendship and gratitude -- still dot the land from Maine to Hawaii, Washington to Florida.